Back in July I was able to visit Valley Green for the first time since I was a child 1. This gorge, which is one of the most amazing natural wonders in the Philadelphia Area, has a wonderful history. It was built up as a park during the heyday of the WPA as The United States emerged from the Great Depression. It’s main path, Forbidden Drive, used to be a turnpike through the gorge. It was closed to motor vehicles in 1924. The sharp drop off the Wissahickon in this area allowed the creek to power 25 mills throughout the gorge in the 1800’s. Remnants of the mill dams are still seen to this day. 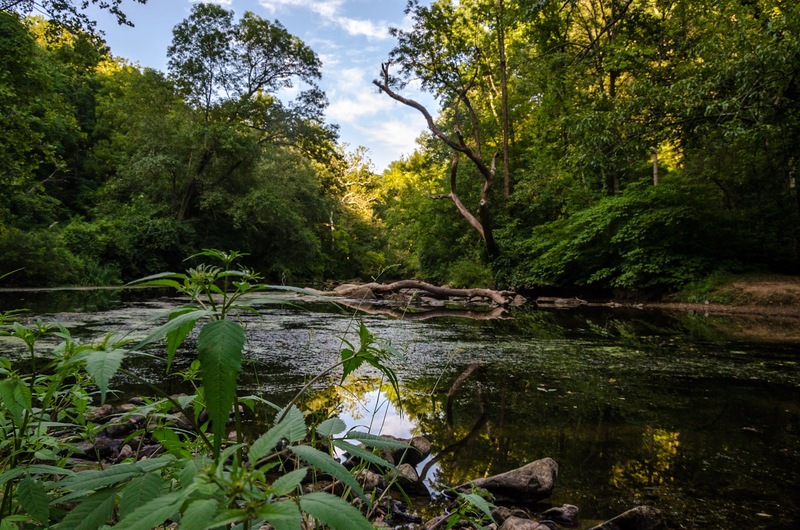 In 1868 the land which make up the gorge was purchased by the parks commission in Philadelphia to help preserve the quality of Philly’s water supply — making its establishment as a park an early act of conservation. The Valley Green Inn is the sole remaining rest stop in the gorge, one of many which used to dot it’s length. The gorge itself played a roll in the Battle of Germantown. It slowed troop movements through the course of the battle’s events. Capturing a picture which depicts the essence of the gorge, however, is difficult. Along either side of the creek, there’s simply no way to display how closed-in the space at the bottom of the valley really is. Yesterday afternoon, however, I found myself standing on an old dam in the middle of the creek — which also happened to be at one of it’s straightest points. The result was the shot below. It’s been adjusted rather heavily. By the time we arrived at this site the bottom of the gorge was already entering twilight, while high in the canopy the Sun was still shining bright and beautiful 2. Recovering some details in the sky was tricky, but rewarding. To me, this image captures the feeling of walking through the gorge, through a crack in surface of the Earth itself.